The lithium test measures the lithium blood level. Lithium lab testing helps manage lithium medication dosing. What is a lithium blood test? The lithium level test measures the lithium blood level. Why is a lithium level test important? The lithium level blood test checks lithium levels to help with lithium dosing adjustments. 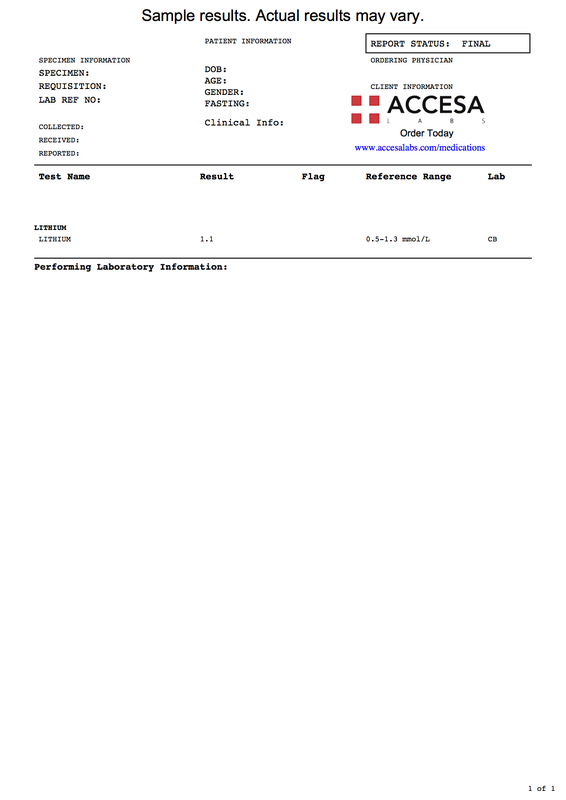 This Lithium Blood Test is a blood test. The lithium test, sometimes known as a lithium blood test, lithium level test and lithium lab test, measures the lithium blood level. Lithium, sometimes known as lithium salts or lithium compounds, is an oral medication used in psychiatry Lithium is specifically used to treat mood and manic-depressive affective disorders such as bipolar disorder and refractory major depression. Regular lithium blood level testing is essential for people who take lithium medications to ensure that lithium levels are within a therapeutic range in the body. Low lithium blood levels might mean that the medication dosage is too low and potentially should be changed in consultation with one's medical provider. Initial symptoms of high lithium blood levels include increased thirst and urination (due to lithium's effects on sodium and water balance in the body) as well as tremors. If lithium levels get too high, it can cause lithium toxicity (poisoning) which can cause a variety of neurological and gastrointestinal symptoms, muscle twitching and kidney failure. Long-term, lithium carbonate use is also associated with hypothyroidism and elevated TSH levels which is why it is sometimes ordered with the TSH test. To get a lithium blood test near you at a Quest Diagnostics lab, simply order online and get your blood drawn at your selected lab. Once the lithium lab report is ready, it will be available for download. As can be seen on the sample lithium lab results above, lithium blood levels will be reported as a number and the lab will include a reference range against which to compare results. All lithium lab results should be utilized in conjunction with a licensed medical provider, particularly when considering any changes in lithium medication doses. Lithium Blood Test at Guaranteed Prices.